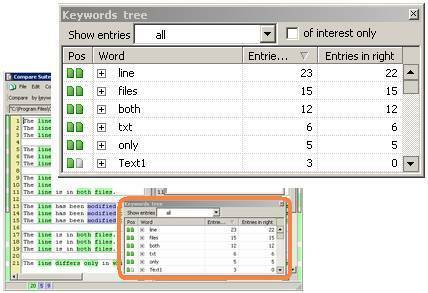 This is a Keywords Tree window of Compare Suite. It appears every time you do comparison by keywords. It is the tree of all keywords found in two documents. The tree table has four columns - Pos, Word, Entries in left, Entries in right. The "Pos" column shows in what text do keyword appears. Note: you can use "show entries" filter to select keywords that appears only in both texts, only in right text or only in left text. You can double click on the text quotation and Compare Suite will find this very text in document and highlights it. Entries shows the number of keywords found in the text of document. Please, note that some keywords were ignored. Lear more in special keywords options. Use "Of interest only" checkbox if you want Compare Suite to show keywords that belongs only to your group of interest. Read more about Groups of Interest in Compare Suite. Special keywords options also has a checkbox that indicates if Compare Suite show show the Keyword Tree windows every time when comparing file by keywords.